Dinner plate size has increased an average of 6.5cm over the last 50 years – that increases the area on your plate by up to 70%! Given these facts, perhaps it’s not surprising at how quickly the obesity crisis has taken a global hold. It has become the norm to expect larger portions when eating out, and this (together with increased plate size) often leads to eating more at home. Your norm becomes bigger and bigger until the bigger is the new ‘normal’. Obviously, everyone is different and will need different amount of foods depending on your weight, how active you are and your current situation. However, there are some simple rules you can apply when cooking and when eating out that will help you get your portion sizes back in check – and there’s no need for weighing scales or any special equipment! This reference guide groups food into different types to make it easy to see what a typical portion* should be. When you’re looking at how much of what to put on your plate, the vegetable part of your meal should take up around 1/3 to 1/2 of your plate, and roughly fill your hands like the picture opposite. Recommended portion size of vegetables is larger than other foods because they are low in calories and provide us with minerals, vitamins and fibre. A portion of fruit would be what you could fit in one hand, or roughly the size of your fist. The exception here is dried fruit, in this case you need to think of it in its hydrated form to get the right portion size. For example, 2-3 apricots would fill your hand, therefore 2-3 dried apricots are a portion. Starchy carbs include foods like; pasta, rice, bread, potatoes, cereals and cereal products. You should look at having a source of starchy carbs with every meal. Good choices are oats, wholewheat pasta, brown rice and wholegrain bread as these are higher in fibre and release energy more slowly. Depending on how active you are, you could have between 1-2 portions (or 1-2 clenched fists) of starchy carbohydrates with every meal. The amount of protein someone needs can vary depending on their weight and what their aims are, but for the general population a portion is around the size of your palm. This would be equal to a small chicken breast, two eggs or a few tablespoons of beans/lentils. Aim to have 2-3 palm-sized portions every day. When you’re cooking with oils, spreading butter or using oil as a dressing, try to stick to no more than a thumb-print (or teaspoon) size portion. In addition to the above, you should also try to have 2-3 portions of dairy products per day. A portion is a matchbox size of cheese, a standard yoghurt pot (~125g) or a 200ml glass of milk. A serving is a measured amount of food or drink, such as one slice of bread or 100mls of juice. 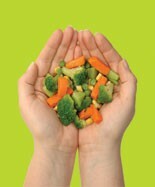 A portion is the amount of food that you put on your plate to eat, you choose whether this is a big or a small portion. Take soft drinks for example, they will often quote a serving size on the label that is less than the amount within the bottle. I feed my family with this in mind at home. The problem lies when we go out to eat. Meat portions are often three to four times the recommended portion. I have found that splitting the meal in half when it first arrives helps. I eat half and take the other portion home.